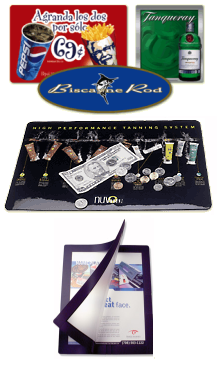 BetterCounterMats.com is an industry leader in innovative Point-Of-Purchase Counter Mat Display solutions. We want to be your counter mat company. Our goal is to provide you with the most innovative designs at the lowest possible cost. Call or email for a discounted price quote. Why Counter Mats? Create brand awareness at the Point-Of-Purchase or Service. • Deliver targeted advertising when and where decisions are made. • Stimulate the flow of commerce generating impulse sales. • Are a highly visible, cost-effective advertising medium. • Provide a protective surface on which to conduct business. • Enhance and augment other promotional programs. These businesses, industries, and service providers use Point-Of-Purchase counter mats in their promotional efforts. Shouldn't you? Automotive - Financial Services - Apparel & Fashion - Retail - Pharmaceutical - Beauty & Health - Education - Consumer Electronics - Hospitality - Hotel - Travel - Manufacturing - Real Estate - Transportation - Entertainment - Food & Beverage - Industrial Supply - Legal Services - Airline - Sports - Home Furnishings - Television & Radio - Government - Office Supply - Sporting Goods - Insurance - Medical - Pets - Construction - Publishing - Service - Grocery - Recreation - Credit Card - Communication - Furniture - Advertising - Food Service - Promotional Product - Golf - Rental Car - Fast Food - Equipment Supply - Auto Sales & Service - Safety - Banking - Lawn & Garden - Toys - Floral - Auto Parts - Soft Drink - Convenience Store - Delivery - Physical Fitness - Newspaper - Motion Picture - Cosmetics - Tourism - Dental - Computer & Software - Sign - Equipment Rental - Jewelery - Dry Cleaning - Snack Food - Printing - Boating - Hardware - Sales - Art - Veterinary - Freight - Any company that wants to make their point at the Point-Of-Purchase or Point-Of-Service.